Apple has been delaying the white version of the iPhone 4 for quite sometime, blaming hardware faults encountered during manufacturing to be the main reason. With the model, registering quite a few delays, critics are of the view that the white version would never see daylight and would soon fade away in papers only. 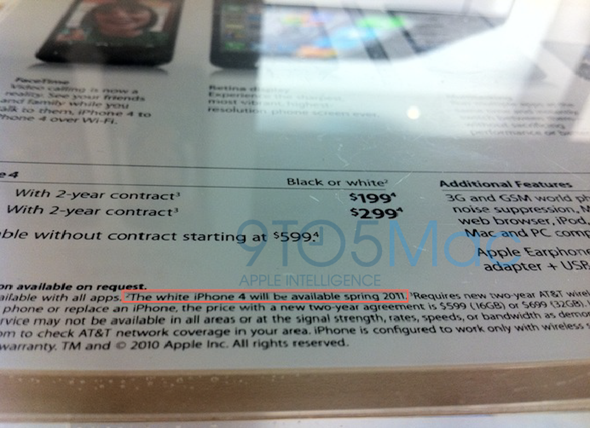 9t05Mac just reported an official leak of a document from the Apple Store which confirms of plans to launch the white version in Spring 2011. According to an internal source, Apple has also confirmed about the upcoming version while it says that this type of model was more difficult to manufacture than expected. Actually, Apple delayed the product almost three times but continued to support it and kept on introducing new products. As the long delays kept on coming, tech bloggers expect that the “White iPhone 4” won’t be able to mark its step as the release of a potential iPhone 5 would be after a few months.